After a deep sleep in a dream of a place, I’m back. In Fes, Morocco. Writing with the sound of evening Islamic prayers drifting through the partially open-air roof of the place I’m staying at. In December. Yep. No central heating. I’m writing this while sitting under one one of those heat lamps they use in outdoor restaurants. And I’m loving it. As I started to explain when I was so rushed to catch my plane, think Morocco and you might think oh yeah, that mysterious, exotic place that starred in Casablanca. 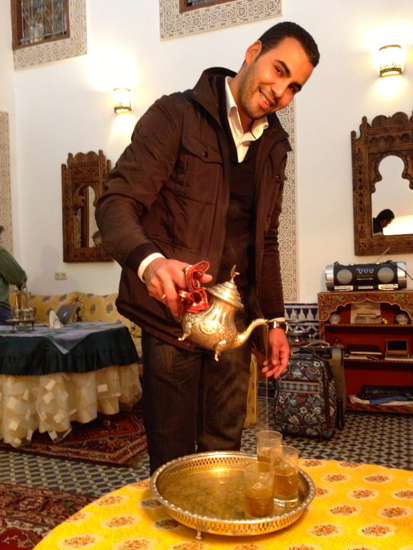 Anyway, back to the trip to Fes — one that won’t break the bank if you play it smart. No one flies directly to Fes. Not even Royal Air Maroc, the national airline, which apparently has the dubious distinction of being one of the worst in the world, next to some outfit that supposedly once sacrificed a goat when there was a technical problem. And Maroc was thousands of dollars from the U.S. No thank you. We used frequent flier miles on USAirways from Philadelphia to Paris. 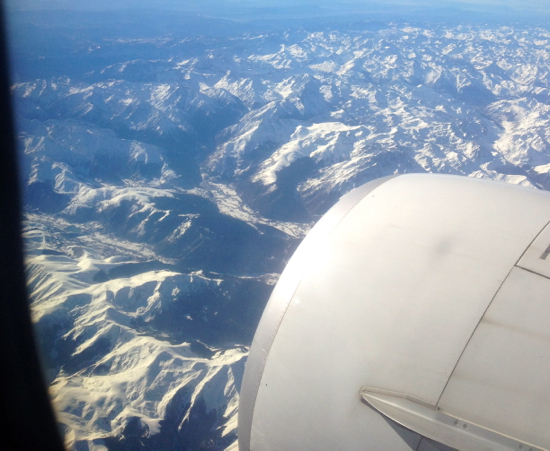 The overnight flight was predictably mundane, including the microwaved muffin that passed for breakfast. Why didn’t we just upgrade to business, you ask? Because it was an extra $880. Per person. Excuse me? After no sleep on the plane (the Jon Kabat-Zinn mindfulness meditation on my iPhone didn’t do the trick), we pulled into the City of Light when it was still dark — before sunrise. Sleep-deprivation delirium started to kick in. 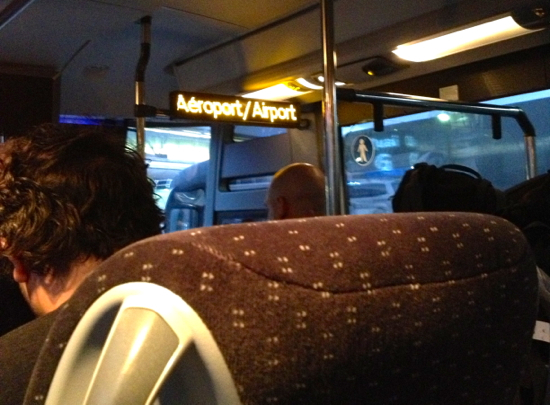 We basically went from one airport to another, bypassing Paris altogether for a connecting flight to Fes. 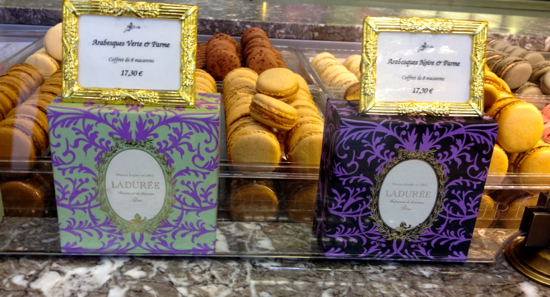 I found myself sleepwalking toward some nice fancy French airport junk food. Cute lil’ French cookies known as macarons. Me, zombie. Crave sugar rush. Mitch purposefully pulled me past in favor of something more nutritious. Time to board the connecting flight from Paris to Fes. This time, we had no choice but to fly pricey Royal Air Maroc. Europe’s answer to Southwest, Ryanair, which, I might add, is also on the same bad airline list (catching it on the way back; oh joy), didn’t fly to Fes that day. Royal Air Maroc was OK. I passed on the freeze-dried chicken and rice that passed for lunch. 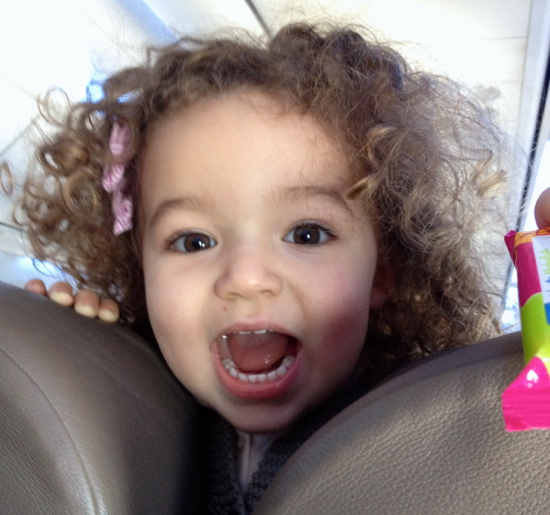 The flight from France to Morocco was mildly interesting. And I had a chance to make pals with a fellow traveler. But not with the airport police. Without thinking, fellow zombie Mitch started to take a picture of the pretty airport with the palm trees. An officer swooped down and politely asked him to delete it. Lesson learned, when it comes to government property and photos. We were fetched at the airport by our host, Soufiane, who manages a family-run riad, or guest house, in the old section of Fes. (Like many other places, there’s an old and new.) In this case, old goes back to the 9th Century. I found this place at Airbnb. (I’ve stayed at Airbnb’s all over the world. They run the gamut from a couch to a room to a whole house. For a fraction of the price of a hotel. It’s how I can afford to travel all the time. Anyway, Soufiane was a little late, but as they say in Morocco, even more patience is a virtue. Or something like that. His cousin was driving. Or, should we say, tailgating in a big way. We had a tiny, ahem, collision with the panel truck we were practically on top of. The truck driver was livid. Words ensued and I thought gunfire would be next, with us caught in the crossfire. Moroccan roadkill, as it were. What can I say? All we could do at that point was duck. Or run. With what little energy we had left. Amazingly, Truck Guy sped off and Soufiane’s cousin returned, sheepish, and clutching what looked like part of a fender and headlight. Sorry, he said. 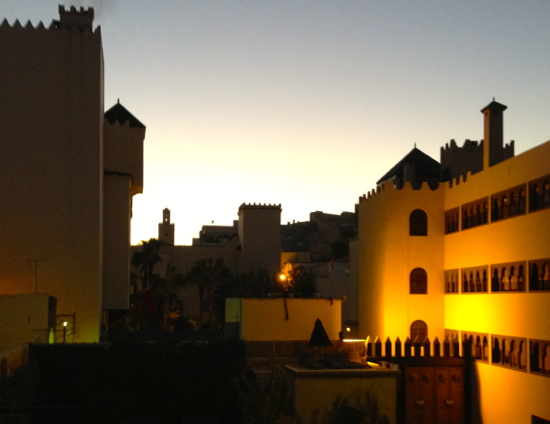 All started to be forgiven when the riad turned out to be even better than the pictures. Check ’em out. And such a price! We were lulled into contentment by soothing hot mint green tea. No Stash; this was the real thing. 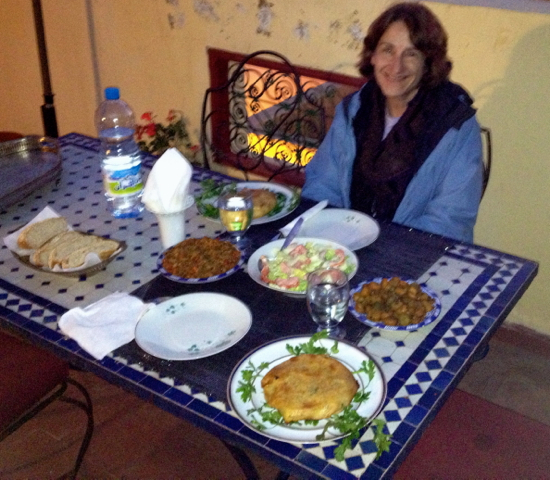 And a fabulous dinner whipped up in no time by Soufiane’s other cousin. On the roof. Yes, in December. The view was too good to miss. Fish pie, dynamite eggplant and carrots for folks who aren’t wild about veggies, great whole-grain bread. And a flan-like custard with grapes. After consuming little in the past week in my sick state, it was heaven. Thank goodness there’s a space heater in the bedroom … and a mountain of velvety blankets. It’s a great place. Oh, did I mention breakfast is included? 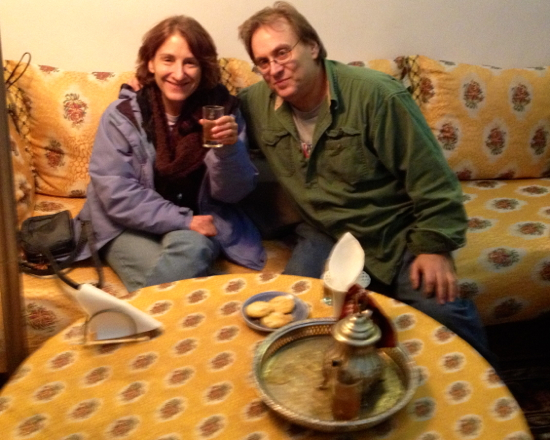 This entry was posted in Africa and tagged Air France bus, Airbnb, Casablanca, Fes, Morocco, Paris, Rick's Cafe, Stash tea, travel. Bookmark the permalink.